If you’ve taught for any length of time, you’ve probably been questioned by a parent about your grading policy. I don’t know about you, but my professors never discussed homework or grading policies when I was in undergrad. I don’t remember my mentor mentioning it during my first year of teaching either. It seems like there is this “assumption” that you’re a teacher, go forth and grade. An inconsistent grading policy across the grade level and within a school is just asking for trouble. It’s like drawing a target on your back for parent complaints and friction within the faculty. 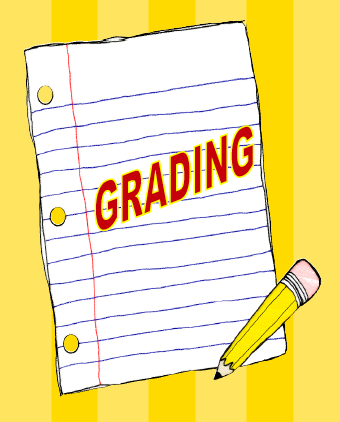 If you’ve ever been on a faculty when they go through the process of adopting a grading policy, you will understand why administrators are reluctant to take on this task. I’m sure administrators feel like they have enough on their plate, so why borrow trouble. Have you heard of Rick Wormeli? Take a few minutes to watch this video. You’ll be glad you did. He has several more videos on youtube that you should watch, too. His ideas are thought provoking, aren’t they? One policy that I would recommend is the policy of my daughter’s middle school math department. Students’ homework is worth 5 points. Teachers give clear expectation about how to earn 5 points. Expectations include things like: name on paper, page #, write problems, show work and correct mistakes. As long as all of the expectations are met, students receive all 5 points. Please note! Getting the correct answer is not one of the expectations. They feel students are in the learning stage when they are studying the chapter and completing homework, mistakes will happen and the mistakes shouldn’t count against them. At this point, making the effort and being responsible for their work is what is important. Each day, class begins with the students grading their own homework assignment (no papers for the teachers to grade). Students don’t cheat because they will get all 5 points if they meet the expectations. Students correct their mistakes which helps two ways. The students will hopefully learn from their mistakes this way, plus their paper will have all of the correct answers so it can be used to study for quizzes and chapter tests. After grading papers, the teacher walks around from desk to desk with his/her grade book, looks at the homework, stamps it, and records the grade in his/her grade book. Less paperwork and an updated grade book, who could ask for more? The grades are weighted. The homework counts for 25% and quizzes/chapter tests count for 75%. I think this is such an important topic and feel we could learn a lot from each other. I would love to hear about your grading policy. I’m joining Joell @ Totally Terrific Teaching‘s linky party. You will want to bookmark her blog and check back from time to time to read all the posts as they are added. Thank you for introducing me to Rick Wormeli. Wow. Good stuff there!